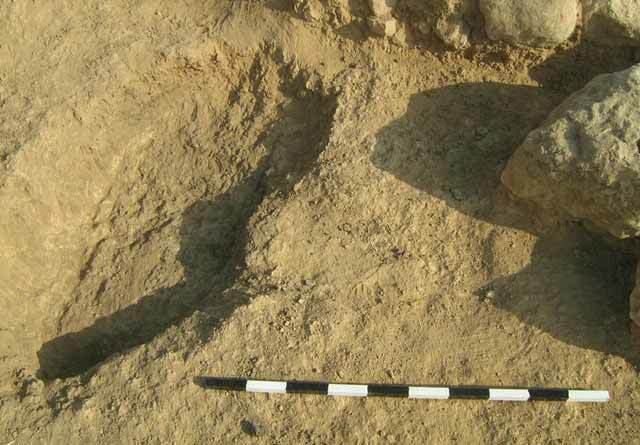 In November 2013, an excavation was conducted at a group of sites east of Dimona (Permit No. A-6939; map ref. 204206–64/552940–4; Fig. 1:7), prior to construction of a new neighborhood. The excavation, conducted on behalf of the Israel Antiquities Authority and financed by the ‘Arim Company, was directed by N.S. 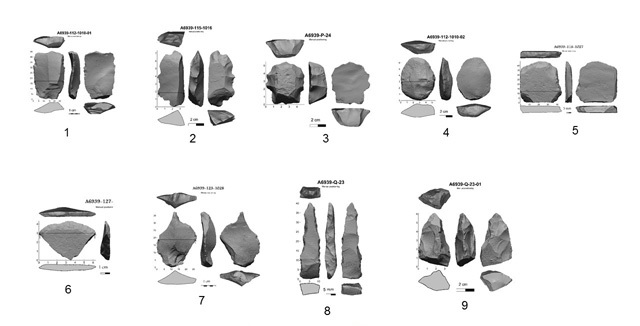 Paran, with the assistance of Y. Al-‘Amor (administration), V. Essman and Y. Shmidov (surveying and drafting), I. Lidsky-Reznikov (pottery drawing), E. Aladjem (flint implements) and A. Karasik (flint drawing), as well as F. Sonntag (IAA district archaeologist), S. Talis (IAA district inspector) and laborers from Kuseifa. The excavation exposed structures and installations from the Intermediate Bronze Age which were identified in a development survey in 2013, conducted prior to the construction of the new neighborhood. The remains were found on an eastward slope (70 × 70 m) delimited to the north and south by two small streambeds; another structure was identified c. 40 m southwest of the main area. The area was surveyed in the past (Vogel 1975:13*; Eldar-Nir and Shemesh 2014), and nearby sites from the Intermediate Bronze Age have been previously excavated: in 1991, several sites and tombs were found to the south of the current excavation (Nahlieli and Tahal 1993; Fig. 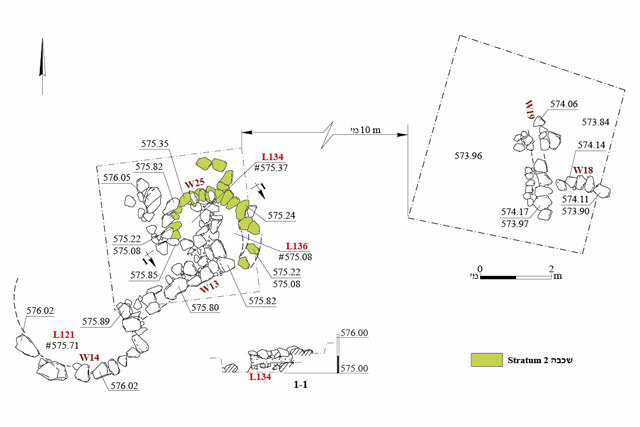 1:8); in 2005, five sites were excavated c. 2 km to the north (Paran and Aladjem 2014; Fig. 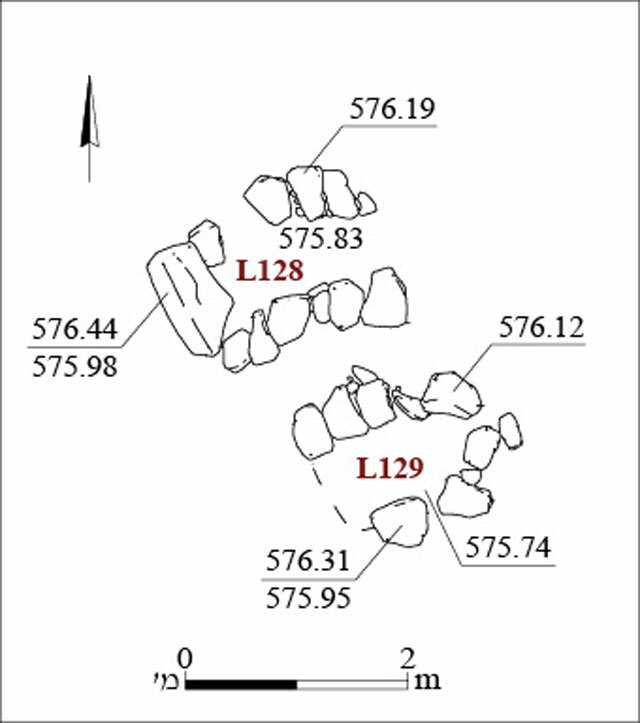 1:1–4); and in 2013 and 2014, three excavations were conducted in the vicinity of the current excavation (Paran 2018a; Paran 2018b; Paran 2018c; Fig. 1: 5–8, 10–12), which also yielded sites from the Byzantine, Ottoman and British Mandate periods. 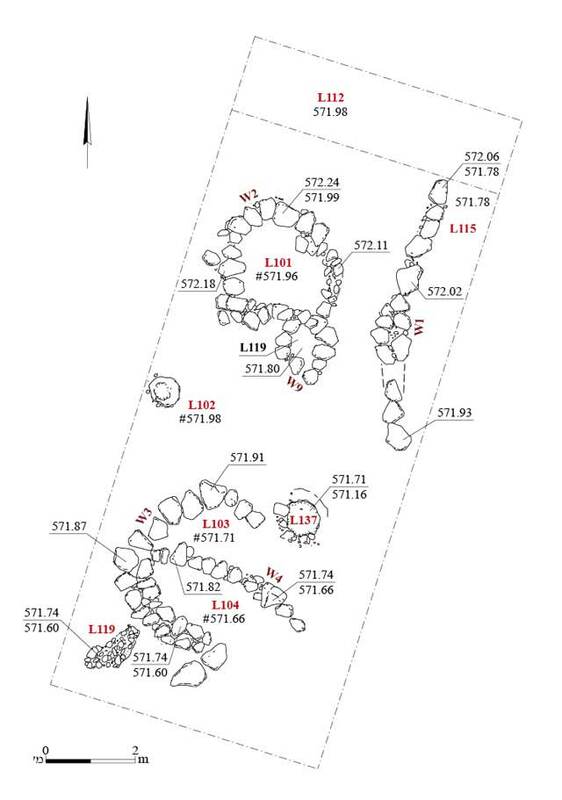 The current excavation unearthed the remains identified in the development survey (400 sq m total area; Fig. 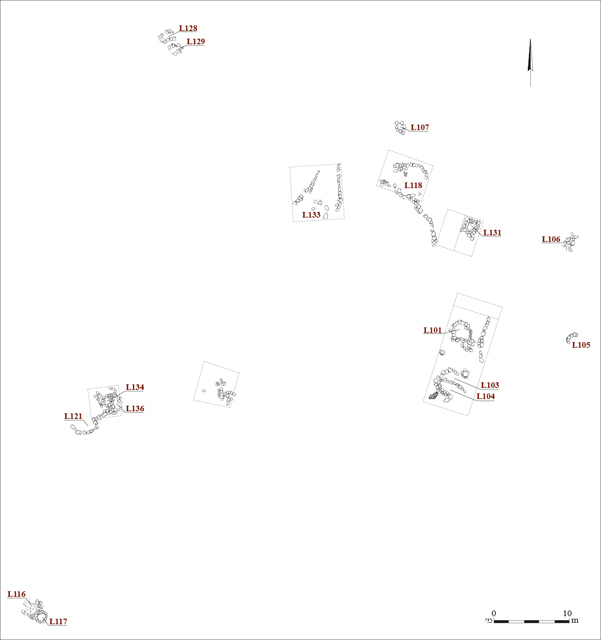 2): installations (L107, L117, L128, L129, L131, L134), one of which may be a cairn (L106); buildings (L101, L103/L104, L105, L116, L118, L121, L133, L136), some of which has nearby walls; and additional walls (W13, W18, W19). The areas between these features were not excavated. Following is a separate description of each feature or cluster of features, arranged from north to south and from west to east. Installations 128 and 129 are both elliptical (c. 1.0 × 1.5 m, depth c. 0.6 m; Fig. 3) and located c. 1 m apart. Each installation is built of a single row of stones. Installation 107 was locatedc. 35 m east of Installations 128 and 129. It is also elliptical (1.2 × 1.6 m, depth 0.7 m; Fig. 4) and built of a single row of stones. Structure 133. A circular structure (diam. c. 3 m; Fig. 5) was partially preserved c. 15 m southwest of Structure 107. It was built of a single row of stones (W24) surrounding a tamped-earth floor found 0.1–0.2 m below the surface. Two long walls (W8, W23) enclosed the structure from the west and east. They probably met at their north end, c. 7 m north of the building, delimiting a space that may have served as an animal pen. Structure 118. A circular structure (diam. c. 4 m; Figs. 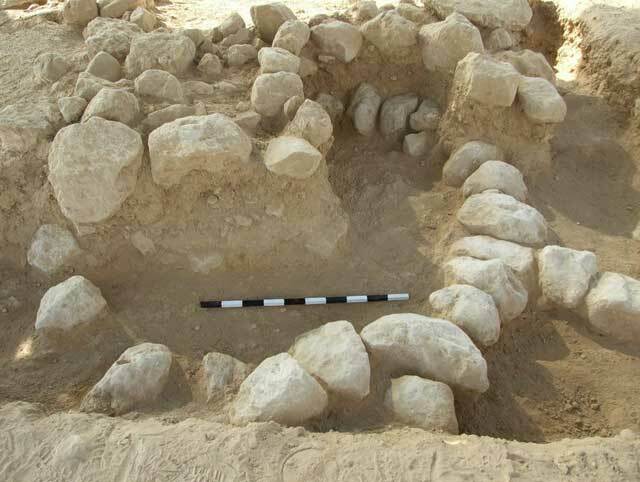 5, 6) was unearthed c. 10 m east of Structure 133 and c. 5 m south of Installation 107. The structure comprises a wall (W12) built of a single row of stones, several of which were arranged standing on their narrow side, surrounding a tamped-earth floor found 0.2 m below the surface. A wall (W15; length c. 7 m), whose function was not ascertained, led southeast from the structure. Installation 131. An elliptical installation (2.2 × 2.8 m, depth c. 0.4 m; Fig. 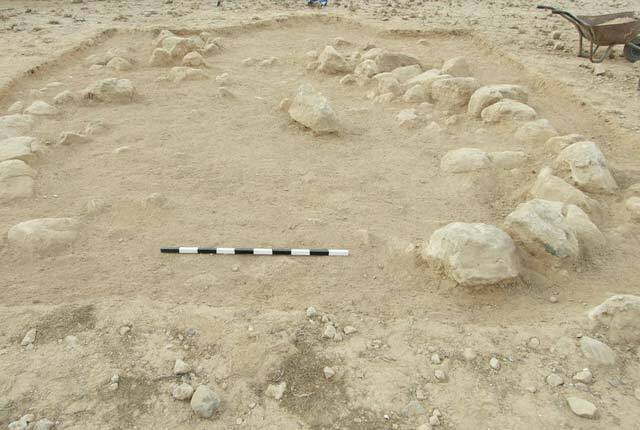 5), located c. 5 m east of Structure 118, was built of two rows of stones. Wall 15, which runs c. 2.5 m west of the installation, may be related to it. Installation/Cairn 106. An elliptical concentration of randomly arranged stones (1.0 × 1.5 m; Fig. 2) was located c. 13 m east of Installation 131. The stones may be the remains of a cairn that has been largely eroded. Structures 101 and 103/104. 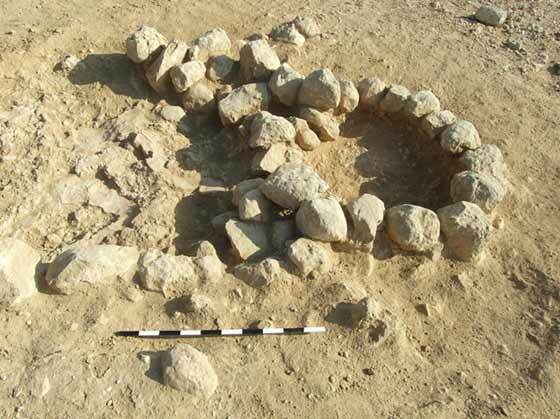 In the southeast part of the site, c. 10 m south of Installation 131, an excavated area (c. 85 sq m) yielded two circular structures surrounded by occupation levels and installations (Fig. 7). The northern structure (L101; diam. c. 3.5 m) comprised a wall (W2) built of a single row of stones. A circular installation (L113) encompassed by a wall (W9; Fig. 8) built of one row of stones lay adjacent to the southeast of the structure. Another structure (L103/L104; diam. c. 4 m; Fig. 9), c. 3 m south of Structure 101, was built of a single round wall (W3). The structure was divides by an east–west wall (W4) into two halves: northern (L103) and southern (L104). Walls 3 and 4 were each built of one row of stones. 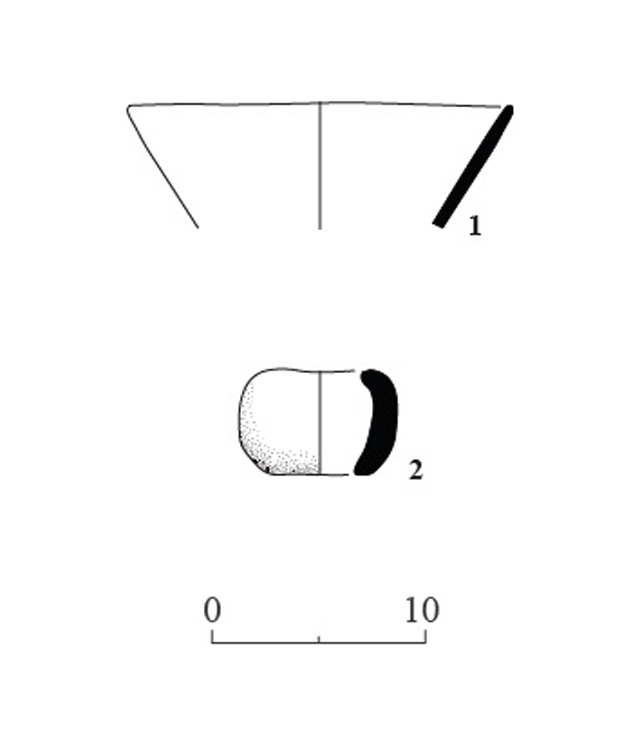 Two elliptical pits dug into the natural soil and containing a thick layer of ash mixed with small stones were found to the southwest of the structure (L119; 0.5 × 0.6 m, depth 0.3 m; Fig. 10) and to its northeast (L137; 0.5 × 0.8 m, depth 0.4 m). A pair of grinding stones was found beside each pit. Structure 105. The remains of a circular structure (diam. c. 3 m; Fig. 2) built of an outer, rounded wall (W5) of one row of stones were unearthed c. 10 m east of Structure 101. Most of the structure was destroyed when a road was constructed. Structures 121 and 136, Installation 134 and Walls 13, 18 and 19. A cluster of installations and structures was identified at the western end of the area, where two strata were identified (Fig. 11). The remains of a large part of a round structure (L136; diam. c. 3 m; Fig. 12) comprising a wall (W25) built of one row of stones belonged to Stratum 2, the lower of the two strata. A northeast–southwest wall (W13) built of a single row of stones was unearthed above Structure 136 and thus attributed to Stratum 1. A concentration of stones placed against the north face of this wall contained an installation (L134; diam. c. 0.8 m); the installation’s floor was set over the remains of W25 from Stratum 2, which served as its bedding. The west end of Wall 13 was incorporated into a circular structure (L121; diam. c. 3.5 m), with an outer wall (W14) built of a single row of stones. This structure may belong to Stratum 2, whereas W13 may have belonged to Stratum 1 and cut into the structure. Two short, perpendicular wall segments (W18, W19) were found c. 10 m east of the complex. These may be the remains of another circular structure, although no abutting floors were exposed. Structure 116 and Installation 117. A circular structure (L116; diam. c. 3 m; Figs. 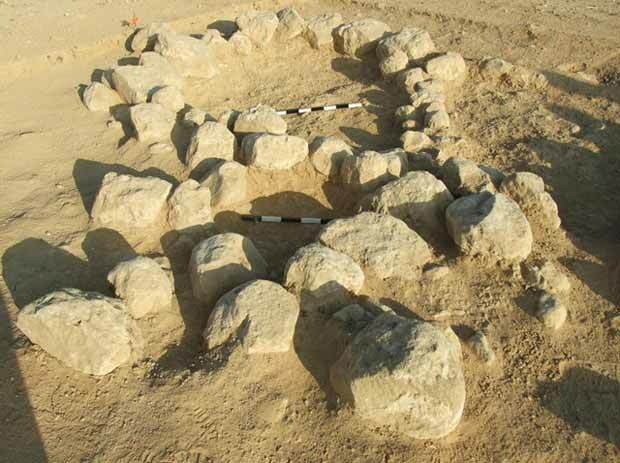 2, 13), comprising an outer wall (W10) built of a single row of stones, was found c. 40 m south of Structure 121. The structure was founded on the bedrock, which served as the floor of the building. An elliptical installation (L117; diam. 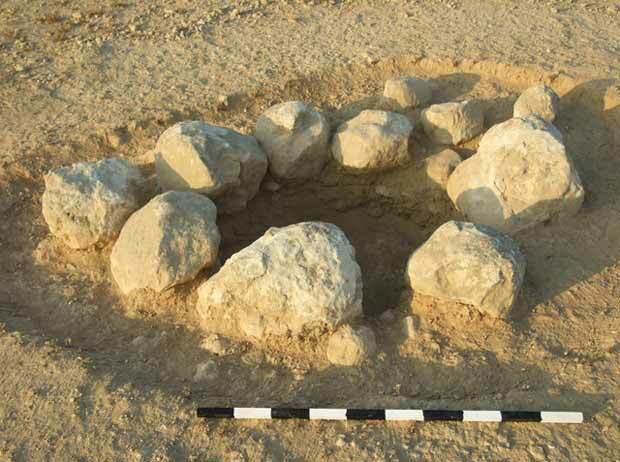 0.9 × 1.0 m) with an enclosing wall (W11) built of a single row of stones was found adjacent to the structure, to its southeast. The installations and structures yielded a rather small number of pottery sherds. Of the several dozen potsherds found, only one diagnostic fragment was recovered: a simple rim from a V-shaped bowl (Fig. 14:1). The pottery also included a fragment of what seems as a small, hand-made spherical bowl or possibly an object in the form of a mace head open on both sides (Fig. 14:2). Also found was a rich assemblage of flint items (Aladjem, below) and two pairs of grinding stones (not drawn). An assemblage comprising 1777 flint items was recovered (Table 1) from the excavated structures and installations; they were not found in any concentration nor did they exhibit any clear distribution pattern. Very few finished tools were found, and most of them were informal, ad hoc implements. The large number of flint cores found at the site attests to a local industry that exploited raw material found nearby. The characteristics of the debitage indicate a non-intensive flake industry with a low level of production standardization. Debitage and Debris. The flint assemblage from the site contains chunks, flakes, blades, primary items, cores and core trimming elements, comprising together 95% of the assemblage; the majority of the this debitage and debris is made up of flakes (59%). There are few blades, and they do not appear to have been intentionally produced. The primary items, most of which are flakes, also seem to have been randomly produced. Sixty-three of the cores are flake cores (Fig. 15:1, 2). The few blade scars were made on flake cores and, based on their appearance, they were unintentional. The cores’ striking platforms were not worked and bear few scars: about 40% of the cores have between one and three scars; c. 50% have four to eight scars; and the remainder have more than eight scars. The small number of scars on each core attests to a non-intensive exploitation of the cores. More than half of the cores (57%) have a single striking platform, and the remainder have two (36%) or three (8%) striking platforms. Multidirectional and unidirectional cores are equally represented in the assemblage. Only one, exceptional core exhibits skilled workmanship: a bladelet core of transparent flint that has14 scars and a worked striking platform (Fig. 15:3). It was probably imported into the site, and is not part of the local flint industry, which is rather uniform and very different from this unique item. The assemblage contained 11 core ridges. This is a surprising feature, since a large quantity of core ridges is usually found at sites with a standardized, highly skilled industry, whereas the other characteristics of this site’s flint assemblage all bear evidence to the contrary. Tools. The assemblage contained 89 tools (5 percent of the total flint assemblage), comprising 13 tool types. The tools indicate that the industry at the site lacks standardization, and is made up largely of improvised, ad hoc tools (Rosen 1997). Typologically, retouched flakes dominant in the assemblage. The assemblage also contains a few retouched blades (Fig. 16:1); denticulates (Fig. 16:2, 3) and notches, bearing a single scar on their perimeter; end scrapers—mostly ad-hoc tools (Fig. 16:4, 5), except for one fan scraper (Fig. 16:6); a perforator (Fig. 16:7); a borer (Fig. 16:8); and a proximal fragment of a bifaced tool (Fig. 16:9). Several tools were worked on primary items. 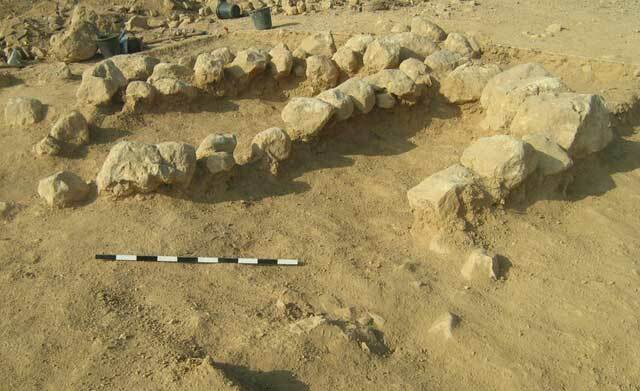 The excavated site is entirely compatible with a series of Intermediate Bronze Age sites that have been excavated and surveyed in the eastern Negev. The majority of these are seasonal encampments that were used by nomads roaming between pastures. This type of economy explains the meagerness of remains at the excavated sites, where most of the structures were probably covered with cloth or straw and were not stone-built to their full height. Eldar-Nir I. and Shemesh N. 2014. 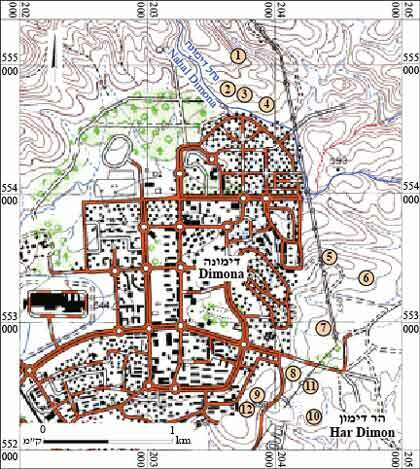 Map of Dimona (174) (Archaeological Survey of Israel). Nahlieli D. and Tahal G. 1993. Har Dimon. ESI 12:99–101. Paran N.S. and Aladjem E. 2014. Harei Dimona. HA-ESI 126. Paran N.S. 2018a. Dimona, Mamshit Neighborhood (A). HA-ESI 130. Paran N.S. 2018b. Dimona, Mamshit Neighborhood (C). HA-ESI 130. Paran N.S. 2018c. Dimona, Mamshit Neighborhood (D). HA-ESI 130. 1. Location map and nearby excavated sites. 3. Installations 128 and 129, plan. 4. Installation 107, looking southwest. 5. 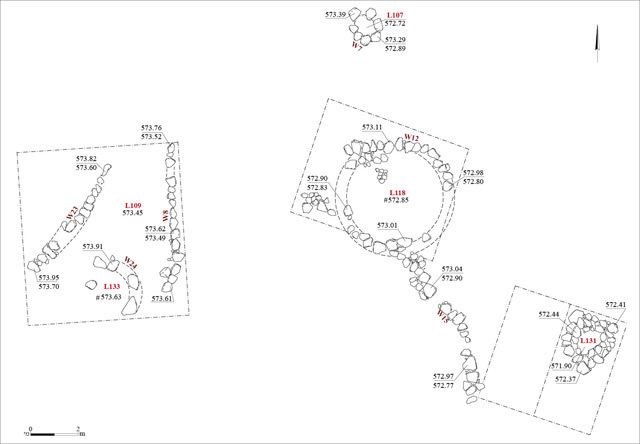 Structures 118 and 133 and Installations 107 and 131, plan. 6. Structure 118, looking west. 7. Structures 101 and 103/104 and Installations 109, 119 and 137, plan. 8. Installation 119 in foreground and Structure 101 in background, looking northwest. 9. Structure 103/104, looking southwest. 10. Installation 119 after excavation, looking north. 11. Structures 121 and 136, Installation 134 and Walls 13, 18 and 19, plan. 12. Structure 136 from Stratum 2 beneath Installation 134 from Stratum 1, looking west. 13. Structure 117 and Installation 116 to its right, looking northeast.